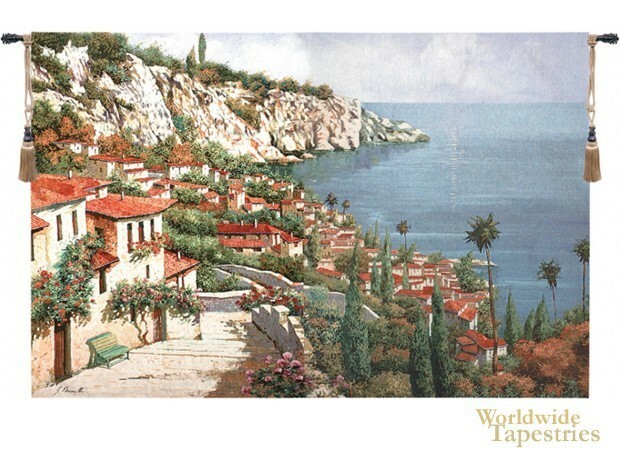 In this Bellagio Park tapestry, we see a glorious scene of the "Pearl of the Lake" of Lake Como. Filled with romanticism and the beautiful climate of the area, we see the charming cottages perched on the cliff faces beside the lake. Lake Como in Lombardy Italy is the third largest lake, and has been a retreat for artists and nobility for centuries. Lush plants and trees also seen to provide green to contrast with the red roofs. This Bellagio Park tapestry is backed with lining and tunnel for easy hanging. Note: tapestry rod and tassels, where pictured, are not included in the price. Dimensions: W 90" x H 70"